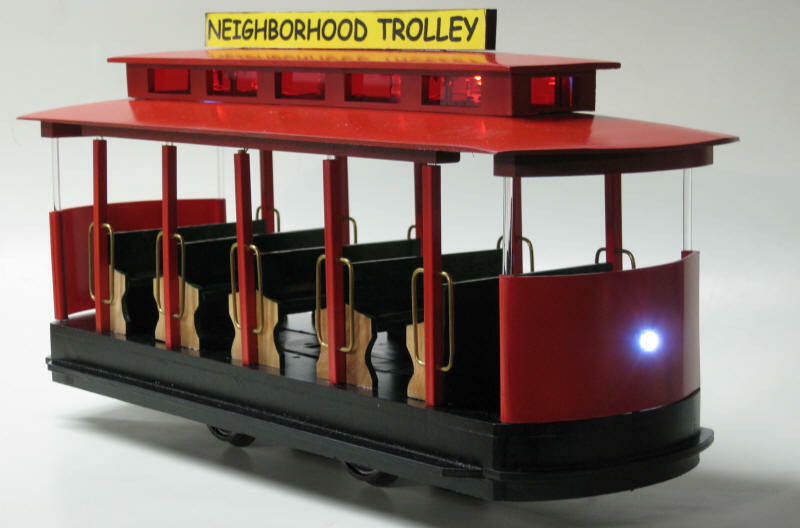 I recently scratch built a Mr. Rogers Trolley that will be donated to the Pittsburgh's new Children's Hospital train layout. After completing the trolley itself I wanted to add appropriate lighting. The clerestory needed diffused red lighting and the front and rear needed bright directional lights that would clearly show the trolley as it moves along a point-to-point route. The biggest challenge was related to the point-to-point track that the trolley will run on. At each end of the track the trolley will completely lose power for a time as it waits to reverse. I needed a way to keep the lights shining even when the trolley gets to the end. I also needed a way to supply the clerestory with diffused light rather than the focused beams that LEDs traditionally provide. The windows in the clerestory are made from translucent red Plexiglas. I wanted to use LEDs for all of the lighting on the trolley but didn't want to have bright points of light that LEDs typically generate emanating from the windows. I had a number of large white LEDs that were 10 mm in diameter rather than the 5 mm or 3mm LEDs that we use in most applications. They had a rounded lens on the end that projected a beam of white light ahead of the LED. My first thought was to roughen up the LED with sandpaper to diffuse the light but that didn't give very satisfactory results. Next I used a belt sander to completely remove and flatten the curved end. That gave a significant improvement since the light from the LED illuminated the flattened area causing light to reflect to the sides. That is the way I initially modified the LEDs that I mounted in the trolley. You can see from the photo at the beginning of the article that a good deal of light comes from the side of each LED. It is not as diffuse as a fluorescent bulb or a frosted incandescent bulb but is a vast improvement over focused beams. 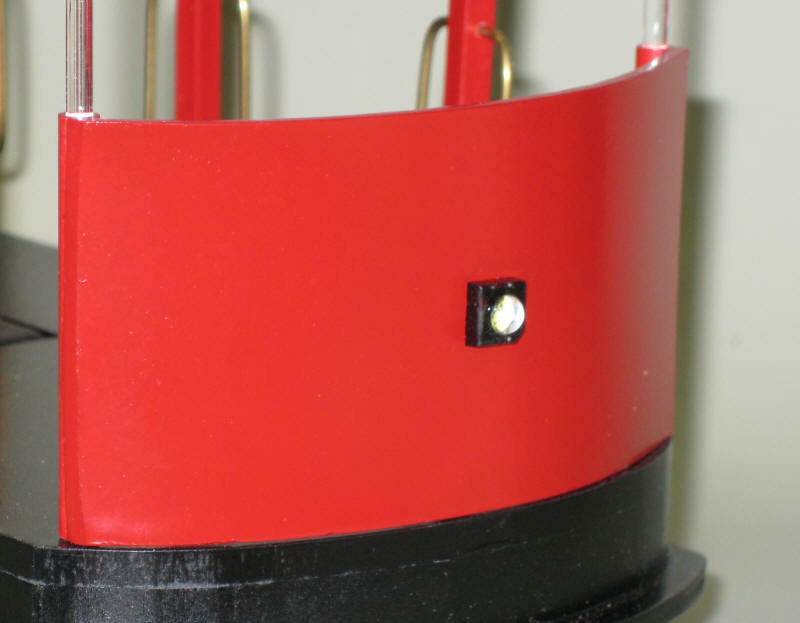 The LEDs are mounted on the roof of the trolley by inserting each LED's leads into two 1/16" holes in the roof. They are wired in parallel with all cathodes wired together and all anodes wired together. The wires from the LEDs go down a hollow post to the bottom of the trolley's base. A current limiting resistor is in the base of the trolley. After I completed the clerestory on the trolley I continued my experiments with ways to diffuse LED light and came up with a method that works even better than flattening the tops of the LEDs. 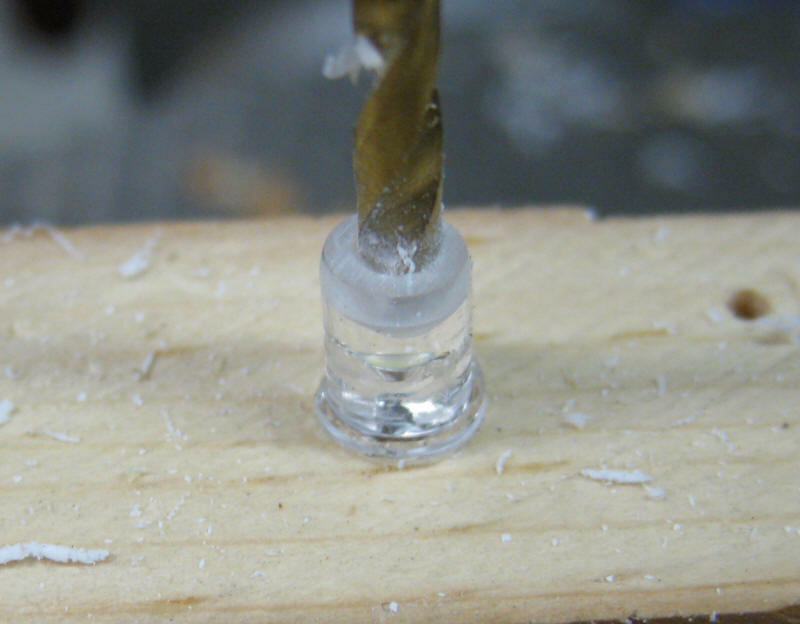 After flattening the end of a 5mm white LED I drilled a 7/64" hole in the flattened end. This was done on a drill press with the LED sitting on top of a scrap of wood with a hole in it to accept the LED wires. In this photo you can see the drilled 5mm LED with its leads poking through the hole under it. Hold the LED in a pair of pliers and make sure that you are very careful to drill only a short distance into the plastic. 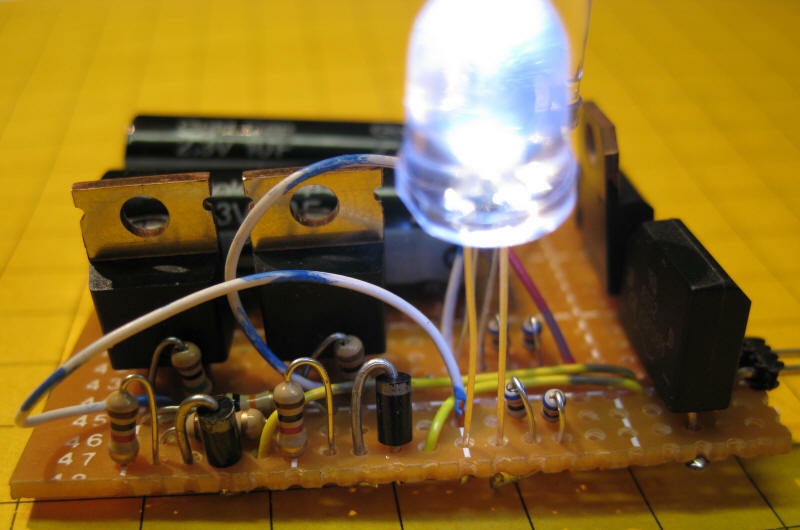 If you go too far you will hit the diode junction and destroy the LED. 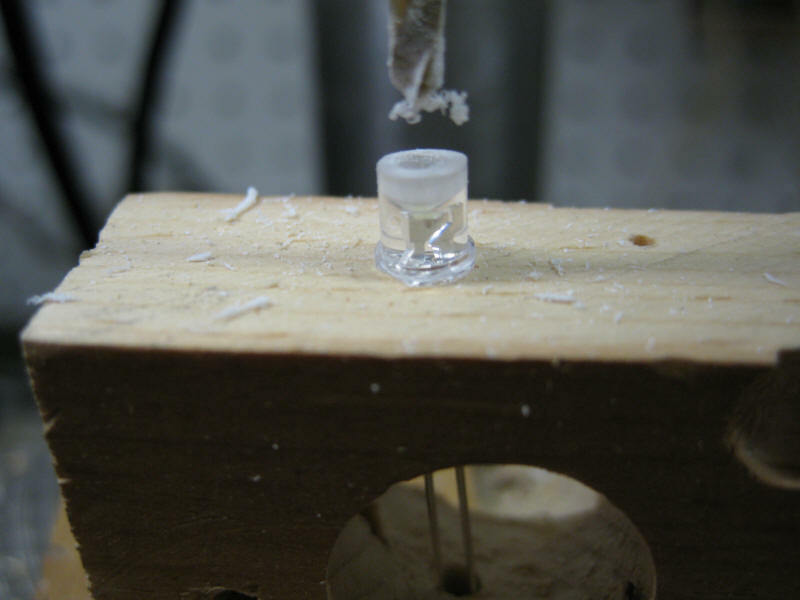 If you have access to a small lathe you can drill the holes right into the lens of the LED. 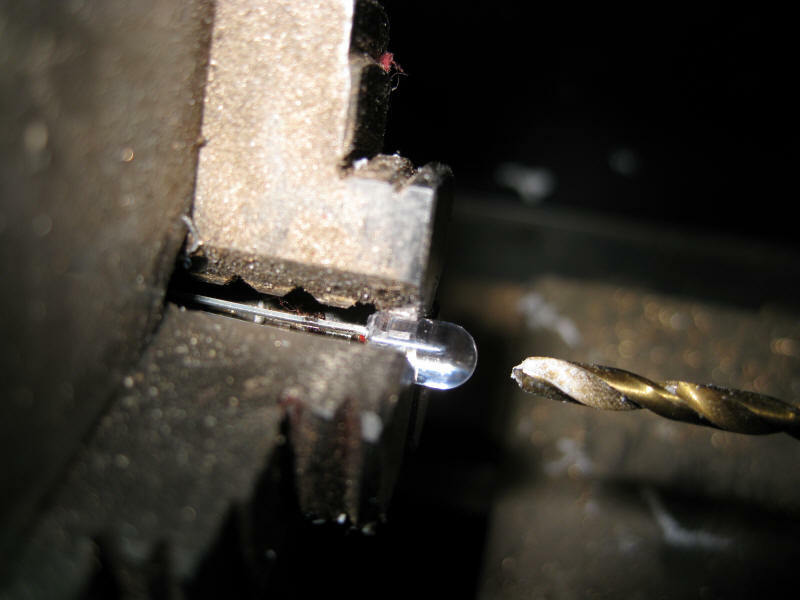 Note that the plastic collar at the base of the LED has been removed so that it fits more squarely into the chuck. The LED is placed in the lathe's chuck and a 1/8" bit is mounted to the tail stock chuck. In this photo you can see the difference in brightness when viewed from the side. 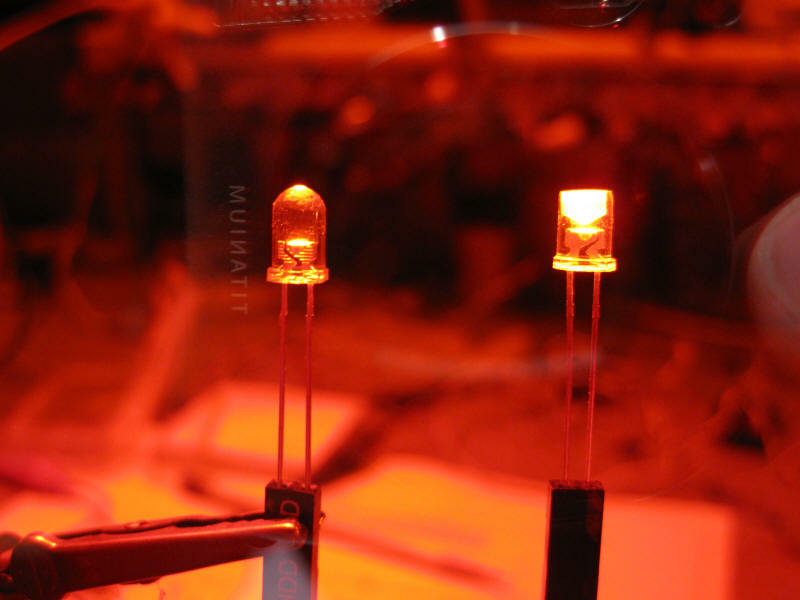 The same LEDs are shown here photographed through a red filter which makes it easier to see the difference in brightness. You can also see the convex shape that the drill leaves at the bottom of the hole. This acts as a reflector that directs the light to the side. 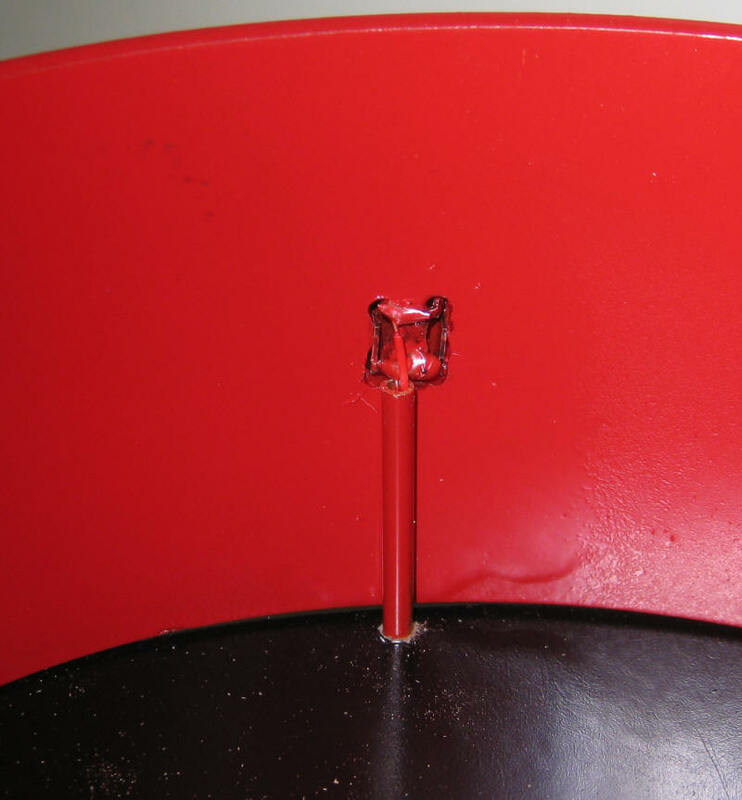 The brightness was increased a bit more by placing a drop of plastic solvent glue (ProWeld) into the hole in the LED. This tends to soften imperfections that are left by the drill enhancing the reflective area. Once the clerestory wiring was extended into the base of the trolley the next task was to get power to them. The motor, wheels and gearing for the trolley are from an AristoCraft EggLiner. The same power unit is used in a number of their other locomotives and it has proven to be very robust and trouble free. Minor rewiring was done to the unit to keep things as simple as possible and to facilitate swapping out the whole power unit should one fail. Here is the power unit from an EggLiner before modification. The red and black wires connect to the power pickups on the wheels and the green and blue wires go to the motor. The green and blue wires were cut off at the motor. 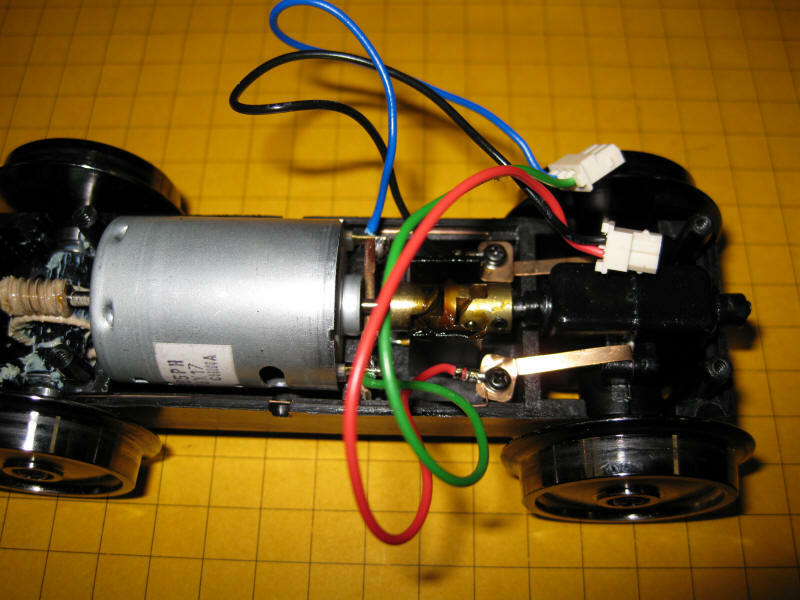 The red and black wires were shortened, stripped, tinned and soldered directly to the motor contacts. 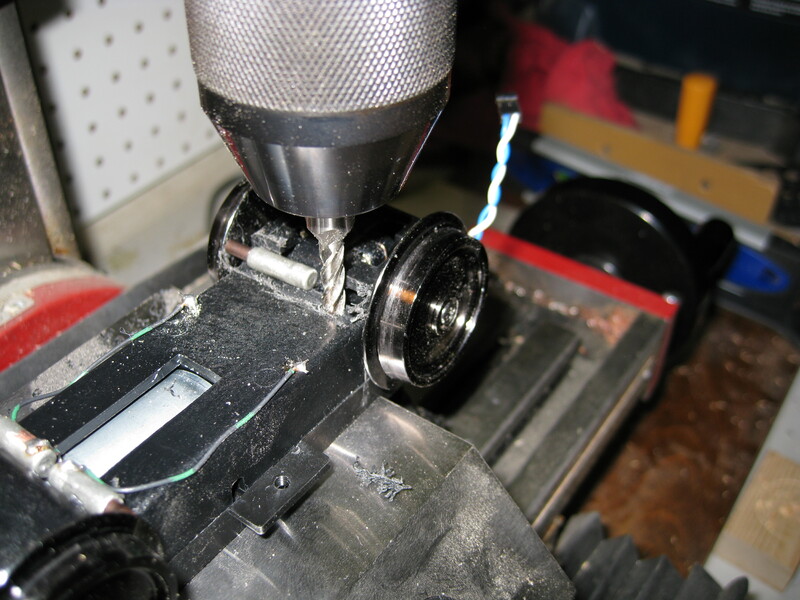 1/16" holes were drilled directly under the motor contacts to allow wires to extend to the bottom of the motor block. Those holes cannot be seen in this photo. To provide access to the track power for the LEDs I drilled two 1/16" holes in the front end of the case and ran wires through the holes from each of the track pickups. 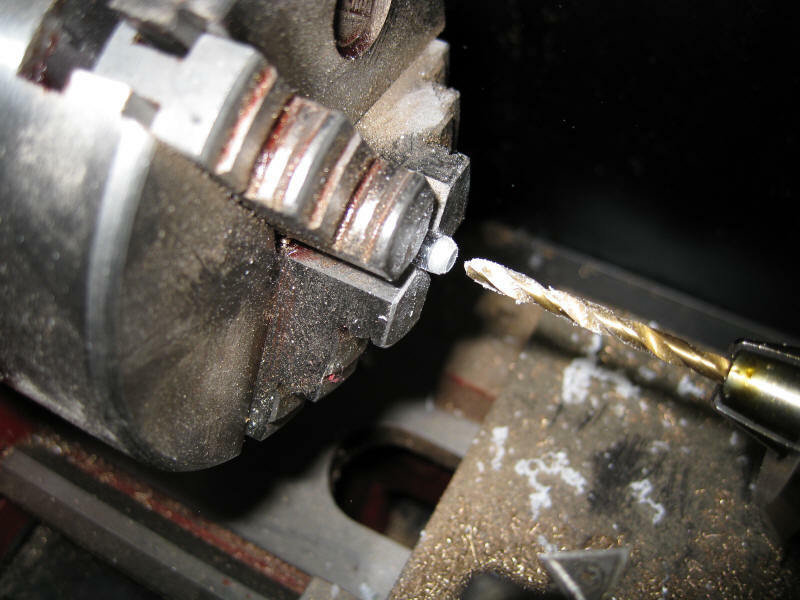 Note that you must drill through an internal header as well to keep the wires out of the drive mechanism. Many times the biggest problem with running a point-to-point trolley is picking up power from the track. It order to improve power pickup I added 4 LGB style spring loaded contacts to the bottom of the power unit. Here two pickups have been added to the right. They make good contact with the inside of the two wheels. The electrical contacts to the motor were extended through two small holes that you can see near the center of the photo. The wires from the pickups are soldered to them. 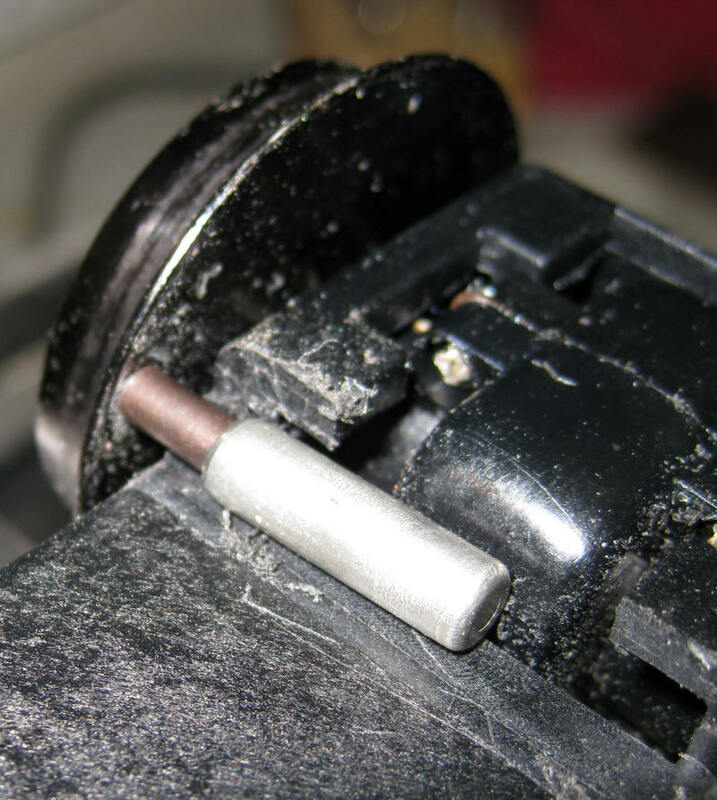 A piece of the frame prevents another set of pickups from properly hitting the sides of the wheels to the left in this photo. The area on the left that is marked with silver paint must be removed to let them make proper contact. 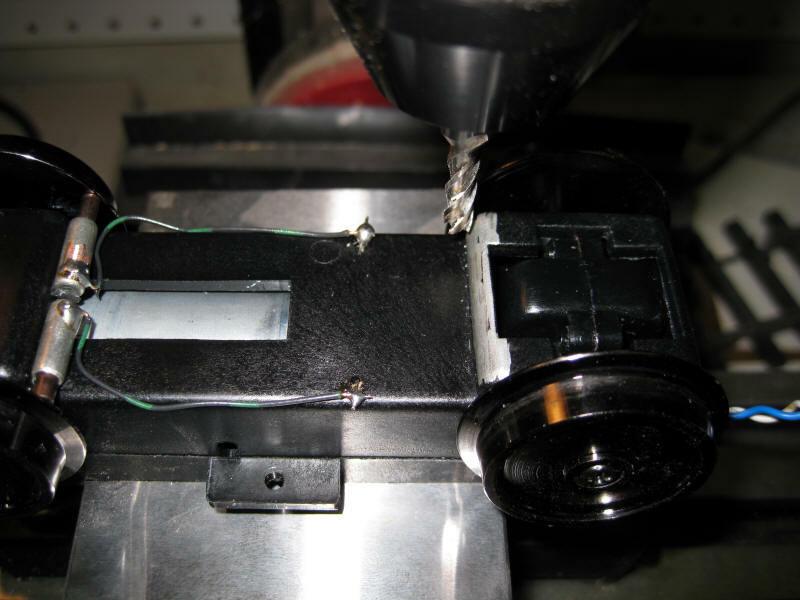 I used my milling machine to remove the excess plastic but you could do the same with a Dremel or similar tool. Here much of the plastic has been removed and a pickup has been inserted to test the fit. You can see how well the pickup mates with the inside of the wheel. Here is the finished motor block with four additional pickups and the power connection for lighting. You May Have to Flip the Motor! One word of caution. If you use the EggLiner motor block like the one above and plan on wiring it as I did you must flip the motor so that its terminals pick up power from the opposite terminals. The first time I wired the power block as shown here everything worked properly but the trolley did not stop when it came to the end of the point-to-point where a diode is set to cut power. The direct wiring that we did does not give standard large scale polarity related to direction of travel. Since I was going to operate this trolley on a point-to-point that other large scale trolleys and/or locomotives might use I opted to flip the motor rather than change the direction of the diodes on the track. 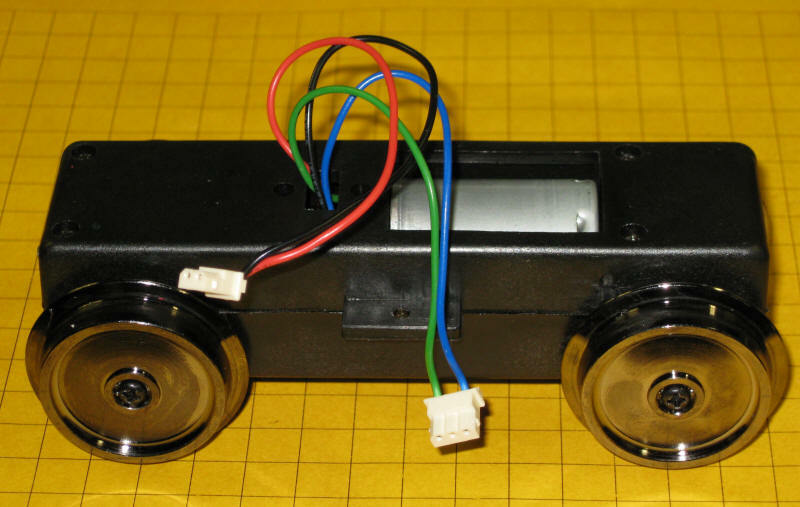 To test that you have it wired correctly connect the negative terminal of a power supply to one of the top pickups or wheels (with the motor block oriented as shown above) and the positive to a lower wheel or pickup. The wheels should turn counterclockwise and the trolley should move forward. If that is not what you get flipping the motor is the easiest way to correct the problem. Keeping the Lights on with SUPERCAPS! The biggest challenge of this lighting project was to keep the LEDs in the clerestory and at the front or back of the trolley lit even when power was removed from the track at each end of the point-to-point. I knew that a capacitor had the ability to do this since I had used them in the first Children's Hospital layout that we worked on some years ago. (see: Give Your Engines the Capacity to Ignore Dirty Track) The problem with the capacitors that I used in that application was their size. The smaller ones were over 4" tall and nearly 2" in diameter. The Mr. Rogers trolley had no where near that much space under the frame. Fortunately a new generation of capacitors, called Supercaps, provides another alternative. 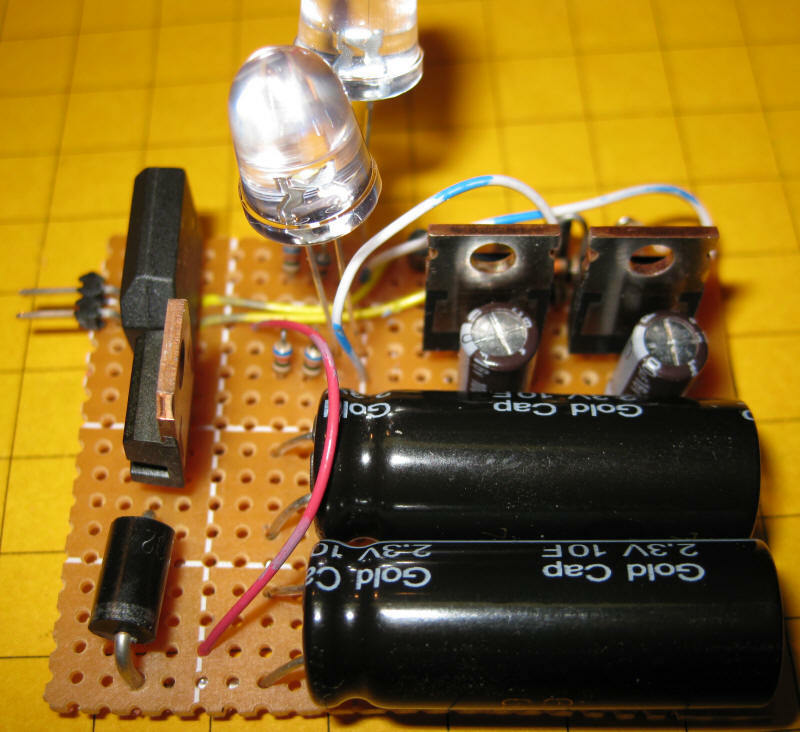 Super capacitors, sometimes called ultra caps or supercaps, are a relatively new development. They behave much like normal capacitors but have much more storage capacity. For more information on the technology behind them have a look at this link: http://en.wikipedia.org/wiki/Supercapacitor. There you will learn about a wide range of things for which they are being used, including an experimental city bus that runs on them and gets recharged at every stop. 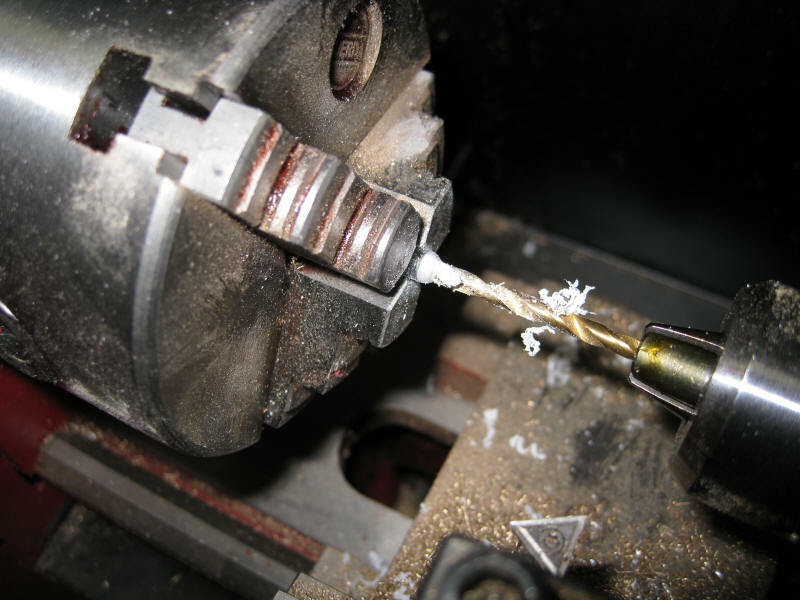 There is also a portable electric drill that operates from a supercap, see: http://www.colemanflashcellscrewdriver.com/ . I am sure that we will see these intriguing devices used in more and more applications in the next few years. In order to increase the voltage that they supply, which is typically only a few volts, super caps are frequently wired in series. This increases the voltage while the capacitance decreases. The supercaps that I have been experimenting have a rating of 10 farads at 2.3 volts. That is not enough voltage for our LEDs but putting two in series gives 4.6 volts, more than what we need. a diode (D7) to drop the voltage that goes to the caps from 5 to a bit below their 4.6 volt maximum. Use a 1N5408 (rated @ 3 amps) -if you use another diode check it to confirm a 0.7 volt drop. The bridge rectifier (D1) converts DC of varying polarity to a consistent polarity. The voltage is dropped to 5 volts by the LM7805 voltage regulator. The output voltage is still a bit above the 4.6 volt maximum that our two capacitors can handle so diode D7 (a 1N5408) is inserted between the output of the regulator and the rest of the circuit. You will recall that a series diode drops a DC voltage about 0.7 volts so we can be sure that we are not putting an excessive voltage into the capacitors. The five LEDs (D2-D6) are wired in parallel with the two capacitors. Note that there is a resistor (R1-R5) in series with each LED to limit the current that the LED can draw. When power is applied to the track the capacitors will take a few seconds to charge. Once they come up to voltage this circuit will keep the LEDs lit brightly for well over 5 minutes each time the train is stopped. Depending on the types of LEDs you use they can remain illuminated to some extent for well over 15 minutes. The time that you will see light from LEDs also varies based on their color. White LEDs take a higher voltage, usually in the neighborhood of 3 volts, to give any light at all while amber, red and other colors take only a volt or so to light. I have had amber and green LEDs stay illuminated for 45 minutes with just the two super caps shown here. The trolley will be controlled by my BARC (Blinking Auto Reverse Controller) which can easily be set to reverse the trolley before the lights in the clerestory completely extinguish. I have found that it is best to get the trolley moving again before the supercaps completely discharge as the voltage regulator has to handle a brief 2 amp surge when they are completely discharged. The lights at either end of the trolley presented a few additional challenges. The first was selecting LEDs. I wanted them to be very bright since some of the trolley's operation would take place in a lighted room at the hospital and I didn't want them to be overpowered by the room lights. More importantly I wanted lights that looked good. The typical 5mm bullet shaped LEDs are fairly long and would project farther out of the trolley than I wanted. The end plates on the trolley were made from shaped 3/32" Plexiglas and I didn't want an LED sticking very far out of the front or back of the plastic. In this case another new product filled the bill. In order to achieve greater brightness some manufacturers have started to put multiple LED junctions in one case. These are called multi-chip LEDs. The total light output from the three LEDs on the chip is blinding. This photo of a multi-chip LED was taken through a filter and with the voltage way below what the LED needs to operate. If you look carefully you can make out the three separate diode junctions and the wires that connect to them. They can be extremely bright and come in a number of case configurations. The ones that I chose were ideal for this application since the LED has a square base and a small 5mm lens that barely sticks out above the base. These LEDs have four leads coming out of the back. The leads are wired in pairs with the two smaller leads being anodes and the two larger leads being cathodes. Even though you only need to hook up one of each lead the fact that there were four leads really helped in mounting them to the plastic. I just drilled four holes, inserted the LED's leads and bent them over to secure the LED. I just had to make sure that I joined the two cathodes and the two anodes together before a drop of solder made them a permanent part of the trolley. Thin (30 gauge) wire was soldered to the LEDs and routed through the trolley's base via a 1/16" piece of brass tubing. I also painted the square base of the LEDs black to make it look like a housing. The circuit that controls the front and rear lights is a bit more complex but starts out with virtually the same components that we used on the clerestory. If we were satisfied with having both lights stay on whenever the trolley ran we could have just wired these LEDs in parallel with the clerestory lights and we would have been done. I wanted to have directional lights that would have only the front light illuminated when the trolley was going forwards and only the rear light lit when it went the other way. This would accomplish two things. First it would look better as there is little sense in lighting the track behind you. More importantly it would preserve the power in the capacitors so that the lights would be able to stay on longer when at the end of the track. I also wanted a circuit that would utilize only one additional set of supercaps as they are fairly large and space was at a premium under the trolley. The circuit adds a few components to what we used for the clerestory lighting. LEDs D3 and D4 are at opposite ends of the trolley. R1 and R2 are 30 ohm current limiting resistors that keep too much current from destroying the LEDs. 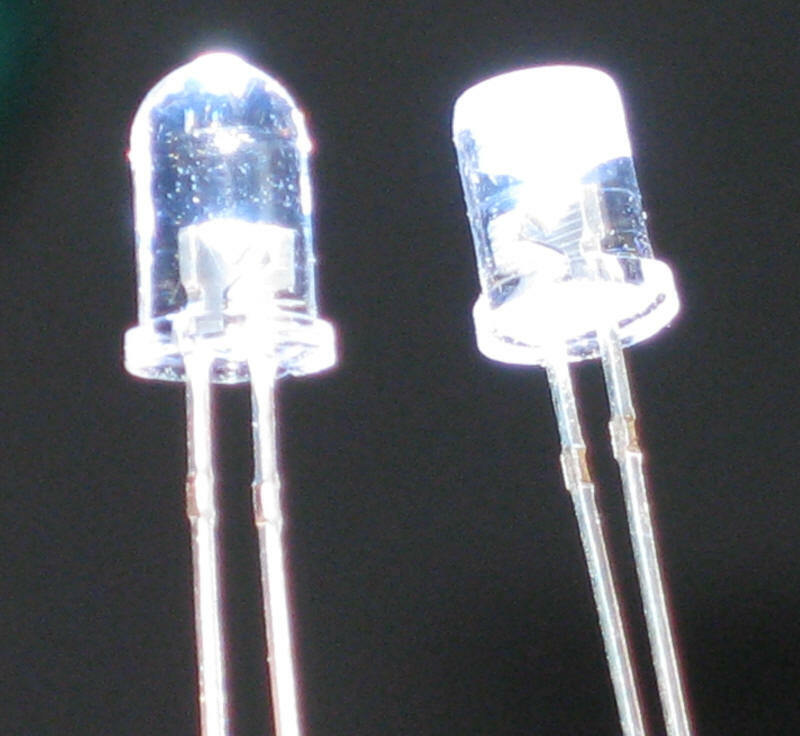 The components that actually turn the appropriate LED on or off are D5, D6, R5, R6, Q1 and Q2. When the polarity on the track is set one way one of the diodes conducts turning on the transistor it is attached to. When the polarity reverses the other diode comes into play. The transistors that I used are a special type of transistor called Mosfets (metal oxide silicon field effect transistors). The work just like regular transistors but have one characteristic that makes them very useful in this application. I'll explain more about that in a moment. We want one of the transistors to turn on when the trolley goes one way and the other when it reverses. That is taken care of with D5 and D6. But we also want that transistor to remain on once the trolley gets to the end of the track where it completely loses power until the polarity is reversed by the BARC controller. Here is where capacitors C3 and C4 and resistors R3 and R4 come in. When one of the transistors is first turned on the capacitor connected to its base (note that the base is called a gate on a Mosfet) charges. When the trolley ends its run the charged capacitor keeps the transistor "on" for a time even though track power is gone. The resistor that is paired with the capacitor slowly discharges the capacitor so that the LED goes out after a few minutes. Remember that we don't want to completely discharge the supercaps if we can help it. The last two components, R7 and R8 , keep both the lights from being on at the same time. When LED D4, for example, is on R8 is connected to ground and discharges capacitor C4 in a second or two extinguishing the LED. Similarly R7 will discharge capacitor C3. The amount of time that the LEDs stay on after the trolley has gotten to the end can be adjusted by changing resistors R4 and R3. Larger resistors discharge C3 and C4 more slowly leaving the lights on longer. Smaller value resistors discharge the capacitors more quickly. To review, when D5 conducts it turns on transistor Q2. Capacitor C3 also charges. When the trolley hits the end of the track D5 no longer supplies power to the transistor and it would go off extinguishing LED D4. This does not happen because of the charge on C3 which keeps the transistor on.C3 slowly loses its charge through R4 eventually turning Q2 off. If C3 is not fully discharged when the trolley reverses resistor R7 will quickly discharge C3 as soon as Q1 is turned on. Now to the reason for the Mosfet transistors. When I first built up this circuit I used standard 2N2222 transistors to turn the LEDs on or off. Everything worked fine, but the LEDs only stayed on for a short time (1 or 2 seconds) after the track power was lost. It seemed that C3 or C4 were discharging very quickly. I tried larger capacitors but that only helped a bit. I did some research and found that regular NPN transistors like the 2N2222 draw a good bit of current through their base lead. That is what was discharging the capacitor. It was losing its charge through the transistor. Some more research led to the use of Mosfets which draw virtually no current through their gate lead. Problem solved! 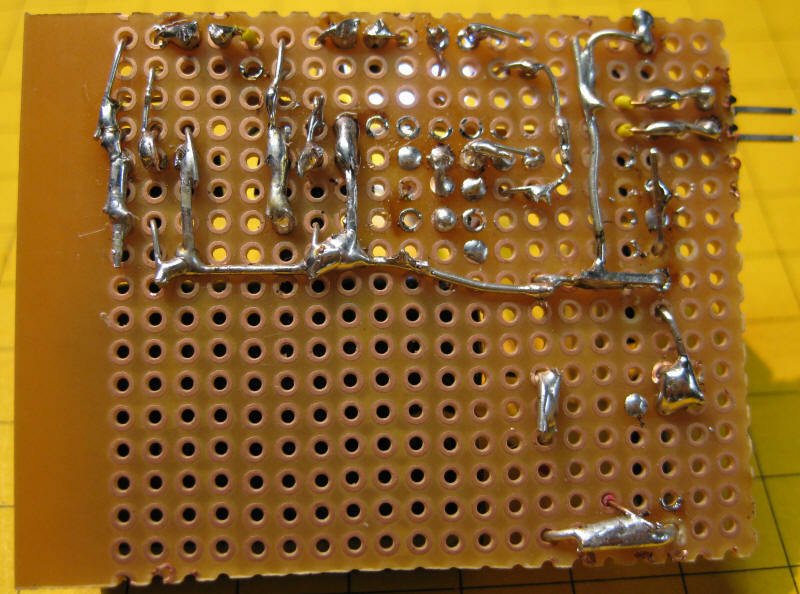 The prototype circuit was built on a small piece of circuit board. The two supercaps are the large black objects at the bottom. The bridge rectifier is in the upper left, below it is the voltage regulator and diode D2. In the upper right are the two Mosfets. Behind them are capacitors C3 & C4. Two 10mm LEDs were temporarily installed for testing. When viewed from this angle you can see the Mosfets more clearly as well as a number of resistors and diodes. The pairs of small resistors in the bottom right are 60 ohms each. They are wired in parallel to give me two 30 ohm current limiting resistors for the LEDs. The wiring on the back of the board is not pretty but it works perfectly! Here the board has been installed under the trolley. In operation the trolley's forward facing headlight and clerestory lights come on when the BARC applies power to the track. When the trolley gets to the end and hits the section of track with a diode in it the trolley stops but the clerestory lights and the forward facing light stays on. If the trolley stays at the end for more than 2 minutes the head light goes off. If it reverses before that time elapses the other head light goes on and the first one goes out in a second or two. I think you will agree that the lighting is more prototypical and more interesting to watch! Even though the project described here is designed for a point-to-point route the same concepts and the circuit from the clerestory can be used on any locomotive or piece of rolling stock where you want lights to remain on even after track power has been removed. I hope you learned something from this discussion and the circuits that are described. I can assure you that I learned a great deal in the process of designing it!